The heat is on … well, it is warming up, at least. Summer is on the way, and you all know what that means, it is time to begin the warm weather ritual of landscaping and lawn mowing. You can get out there and do it yourself, but why should you? Taking proper care of a lawn is hard work, and takes a lot of time. There are people out there who can ease the strain on your body, and your weekend, by getting out there and doing it for you. Remember to hire a professional. Professionals that know how to take care of your lawn while they keep it looking good. Professionals that know the latest horticultural techniques, and will use them to your lawn’s advantage. 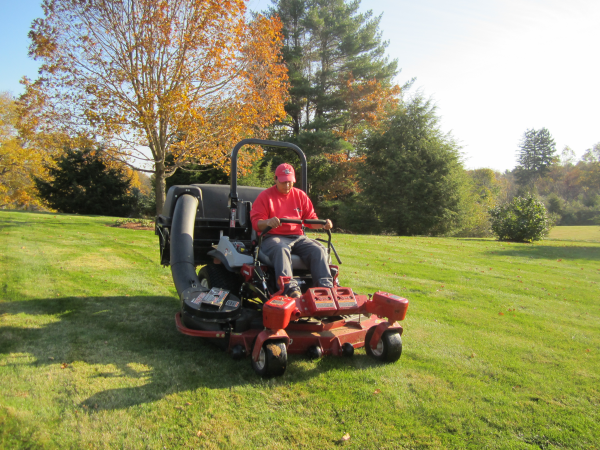 To do the job right, it really takes more than just the simple aspects of lawn care, like lawn mowing and edging. North Attleboro residents are, by and large, quite proud of their lawns and landscapes, and you should be, too. The choice here, friends, is simple, you deserve the best people working on your lawn. This is important, your lawn says a lot about you to your friends and neighbors. You know how you feel when you see a lawn that is well-maintained and obviously taken care of with pride. It makes you feel good, it makes the neighbors feel good, and best of all, it keeps property values up. Using accredited lawn care professionals means you have a leg up when it comes time to take the necessary steps to make your lawn a thing of beauty. Let me give you a little advice that will go a long way for your lawn, before you hire anyone to do anything in your lawn, or to your lawn, ask for and check out their references. A true professional will not balk at giving a potential new client references from former or current clients, they will be more than happy to do so. Find out if they are certified, and if they are, by what organization? Don’t be afraid to put out a little effort, and no pun intended, do a little digging … your lawn, and your neighbours, will thank you for it. The fact is, only about 30% of landscape professionals pass the rigorous tests to become certified. Certified professionals spend a great deal of time studying native and imported plants, but also keep up with the latest lawn care trends and methods. Certifications are not simply handed out to someone for joining an organization. To pass these tests, one has to be able to identify a huge variety of trees, grasses and plants; they have to be able to diagnose and treat pests; they have to know all about the diseases that attack lawns, trees and plants; they have to keep up to date with and be well-versed in the latest planting and transplanting techniques; it is absolutely imperative that they know how to restore damaged lawns, as well as maintain and preserve trees … just to name a few things they must do to get certified. Not only can a certified professional tell you exactly what your lawn needs, they can tell you exactly what you don’t need. The average homeowner can be quite literally overwhelmed trying to learn all there is to learn about proper lawn care and keep up with their own jobs and families. Often, they agree to services that they simply don’t need from people who are out to get as much money from the homeowner as they can in one visit. A professional wants a lasting relationship with the client, and is not out to over bill someone and leave. Distinctive Landscaping can and will do a superior job when it comes to your lawn mowing, fertilizing, irrigation, shrub pruning and landscaping, North Attleboro, we are a name you can trust.